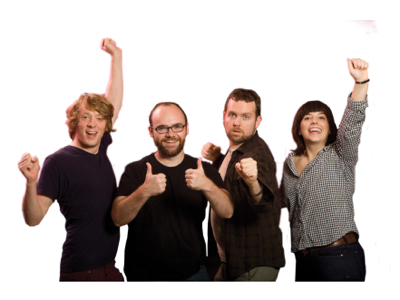 Selected from the country’s best improv comedians, the fast-on-their-feet performers in Upright Citizens Brigade (UCB) are the next wave of comedy superstars, garnering a national spotlight for incredible improv, sketch and standup, and they’re at the Arts Center, taking the stage on November 8. The Upright Citizens Brigade began as a group of four brilliant comedians, Amy Poehler, Matt Besser, Ian Roberts and Matt Walsh, who launched their own sketch show, Upright Citizens Brigade, for three seasons on Comedy Central from 1998-2000. During the success of the TV show, UCB opened the Upright Citizens Brigade Theatre and Improvisational and Sketch Comedy Training Center in New York City. In 2005, UCB expanded and opened the Upright Citizens Brigade Theatre Los Angeles and began offering UCB Training Center classes on the West Coast. Today’s origins of the current improv boom can be traced to 1999, when the Upright Citizens Brigade Theatre opened. Back then, there were no permanent stages devoted to improvisational comedy in New York. Now there are three. With a bustling school (2,500 students enrolled) helping to underwrite its prolific productions, the Brigade—whose recent alumni include the stars of Comedy Central’s new sketch show Broad City and Sasheer Zamata, the newest cast member of Saturday Night Live —has become the most influential name in improv today. UCB wrote the book on improv . . . literally! After seven years of work, the troupe has codified its aesthetic and released The Upright Citizens Brigade Comedy Improvisation Manual. So don’t miss the ride! Tickets are $39 and are on sale now by calling the box office at (843) 842-ARTS (2787) or visiting artshhi.com.